The cake was fairly easy to put together, especially with Allie -- a young woman who truly knows her way around a kitchen -- helping out. We quickly got it in the oven and started on the frosting. The recipe's author had recommended a lemon cream cheese frosting with this cake, but Allie (not a lemon lover) wasn't having any part of that. 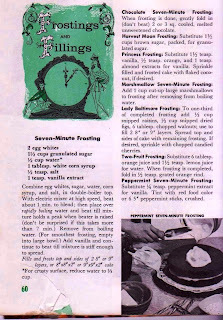 She selected a chocolate Seven Minute Frosting, a true classic from Good Housekeeping's 1958 Cake Book "With decorating ideas for many occasions." 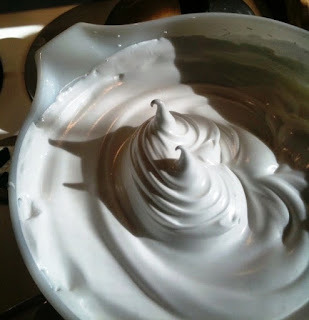 This old-fashioned frosting is basically egg whites and sugar beaten with a hand-mixer in a bowl atop a pot of boiling water until firm peaks form. It's tedious work; the seven minutes is simply an "ideal" and the actual beating usually lasts longer. Things were going well: the peaks formed and the frosting was fluffy and very marshallow-y. Not a bad thing at all. 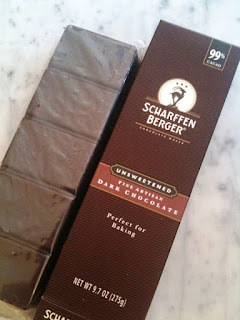 But then I misread the recipe and added the melted chocolate (instead of taking it off the fire and beating it further -- and then adding the chocolate). Immediately, the frosting lost its volume and became almost like chocolate pudding. I couldn't decide whether to toss it and start anew or risk throwing good ingredients after bad to try to save it. The latter option won out. 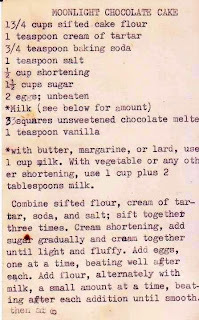 First one stick of butter went in the mixture, then some confectioners sugar, then another stick of butter -- the basis of modern-day buttercream. The frosting got a bit thicker, and the butter and sugar certainly didn't detract from the flavor. "It tastes like chocolate mouse," declared Allie, who having recently returned from a Paris vacation, was quite the authority on these things. She promptly named our new creation "Seven Minute Buttercream." After a bit of refrigeration (a longer time would have been better), we frosted the cake. It needed to set up in the refrigerator before it could be moved to Allie's house around the corner, where it was enjoyed by her family. This is another example of a cake that tastes better the second day. The actual cake is very soft with a subtle flavor. 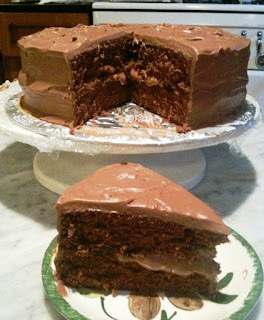 The Seven Minute Buttercream -- my most delicious disaster to date -- is spectacular anytime! I am so excited to see a blog about this. 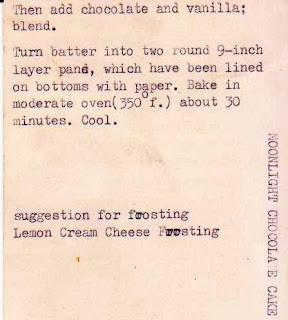 I have a collection of recipes from my late mother-in-law, dated from about 1930-1950s. It really is quite interesting to read them--I only made one of them--but I also love to bake and I think I'll try a few more. A question--some of the recipes call for a measure of something--such as sour cream--how much is a measure? I've been trying to find this out for years to no avail. @Linda: Thanks so much for writing. What I normally do when faced with a measurement question like this is look for similar (modern) recipes and see what amount they suggest and then sort of guess. Or you could do a google image search and see what size containers something like sour cream were sold in back then. It's truly an art -- and really fun. Best of luck to you and your baking adventures! I'm so glad you found my blog. @Allen: You're so sweet. Thanks for the kind words. And yes, I do see more cake in your future (but no acting career for me!). I am so happy to have found the link to this blog through the Daily News article I read online. 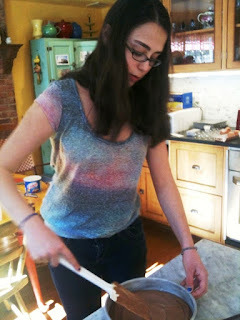 I just love this kind of nostalgic cooking/baking and am very much looking forward to witnessing all your recreations. Love the pics of the original recipes, too! Keep up the good work and have fun!